Petrol distributed in two-gallon cans, a receipt from 1919. Homepage. This page: A reminder of how motor-car fuel was distributed prior to the widespread use of garage pumps. Twenty gallons of War Spirit fuel. 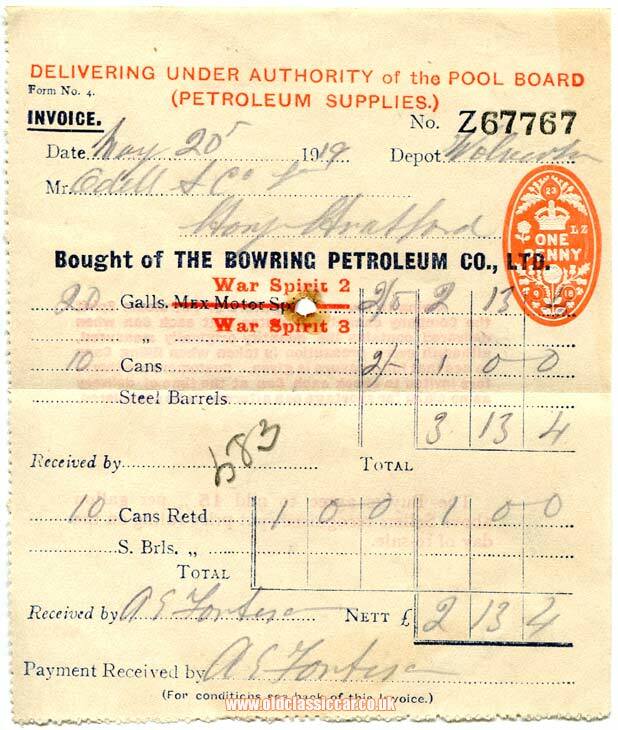 As with the receipt featured on the site relating to Ford's Garage of Alnwick, the piece of paper shown below refers to the purchase of motor spirit distributed in two-gallon petrol cans rather than via roadside pumps. It too dates from 1919. Codell and Co. Ltd, of Stony Stratford, put in an order for twenty gallons of War Spirit 2 or 3 with the Bowring Petroleum Company Limited (Wolverton depot), a company registered in 1900. The original text in blue was for Mex Motor Spirit, but has been ruled out and amended with an ink stamp for a war-grade petrol, "delivering under authority of the Pool Board (petroleum supplies)". "Mex" was so-called due to being derived from oil sourced in Mexico. Bowring's joined up to the Pool Board in 1917, a government-led organisation tasked with the safe and efficient distribution of motor fuel around the country. Shortly after WW1, Shell bought into the firm, leading to the creation of what would be known as "Shell Mex". Bowring's slogans of the time included Mex Speeds The Motor and When on Mex you've something to crow about. The company also produced the "All's Well", "Oberon", "Dominion" and "Hercules" brands of lubricant, and are believed to have been the first importer of barrelled oil into the UK. As each can contained two gallons, therefore ten full cans were supplied, for which a deposit of two shillings (10 pence) per can was charged, refundable on the cans' return. As can be seen on the receipt, ten cans were returned at the time of this latest order, so Codell & Co. were regular customers it would seem. The fuel itself, all twenty gallons of it, cost a grand total of £2 13s 4d. The introduction of fuel dispensing pumps at garages, engineering companies and on pavements outside shops would gradually be phased in during the early 1920s, although it would be some time before more rural locations came to benefit from the convenience that pumps by the likes of Bowser could offer. Until then, hoiking around and storing multitudes of liveried two-gallon cans would continue to be the norm for many motorists, more often than not chauffeurs tasked with driving the cars' wealthy owners about town and to the country. Woe betide any driver who got "caught short" while on a trip, necessitating a walk to town and back, the return trip laden-down with the precious liquid. Owing to the volatile nature of Petroleum Spirit the Company cannot guarantee that each Can when delivered contains the quantity originally measured, although every precaution is given when filling Cans to see that full measure is given. Customers are therefore invited to check each Can at the time of delivery as no claim for shortage can afterwards be considered. Return to the Motoring Collectables section for more garage and car-related literature. More information regarding petrol-related collectables may be found here.